What remains, after a decade exploring the unique constellations, the thickening and blending of the geography of sounds and moving images; after wandering through the wakes of performativity, following ancient procedures of a floating audiovisual region in the edges of systems and disciplines? This is the direct question of this new edition of Netmage, as part of an indirect and continuing research in the field of live media. After a decade of exploration it is the time to verify the evolutions and reactions, the revolutions and delays of sounds and moving images in the age of web culture. This is the reason why the program of Netmage 11 combines, without prejudices and surmounting disciplines, the old tradition of expanded cinema and the new expression of digital images, the evolution of sounds from the minimal experimentations of digital music at the turn of the millennium to the explosion of noise of the last years. 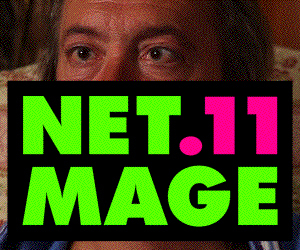 This is also the reason why we consider Netmage, in its turn a hybrid exhibition/program that questions itself, urges and entertains as well, one of the most interesting festivals in the european panorama. James Ferraro is without doubt the most incredible hair ever seen at Netmage in eleven years of activity. One of the strangest, as well, contradictorally coherent, adored and detested in the musical and visual panorama of the US underground. Ferraro has worked for over a year on one film, Toilet Toad T.V. Overdrive, finally presenting it at Netmage in preview. How to define what we have seen up to now, let alone his imagination in general? Perhaps hypnagogic pop, whatever the hell else? Perhaps. Even with that, we’re not sure. James Ferraro is half of The Skaters (unforgettable live on Cinema Vampire by Roland Lethem in 2008, with Spencer Clark), possibly half of Lamborghini Crystal, and another half again solo musician who also runs New Age Tapes dealing with a variety of names (all of which best represent their musical worlds: Newage Panther Mistique, Acid Eagle, Demon Channels, Liquid Metal…) in obscure, impossible-to-find productions and disparate formats (VHS, CDr, tapes…). The opportune definition of hypnagogic pop, fruit of the inventive mind of David ‘Volcanic Tongue’ Keenan, fully embodies this, if by hypnagogic pop we think of an ambient new age schizoid and diseased, of atmospheres ranging from screams of wandering figures to stoned country songs, together with eccentricities equal to the noble musical tradition of Hanna & Barbera, silly video games, the most radical circuit bending and remnants of the primitive cut’n'mix television of travellers on acid.